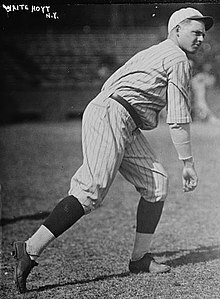 Waite Charles Hoyt (September 9, 1899 – August 25, 1984) was an American right-handed pitcher in Major League Baseball, one of the dominant pitchers of the 1920s, and the most successful pitcher for the New York Yankees during that decade. He was inducted into the Baseball Hall of Fame in 1969. Hoyt was born in Brooklyn, New York to Addison and Louise Benedum Hoyt and attended Erasmus Hall High School. Despite being a Dodgers fan, he was signed to a professional contract by New York Giants manager John McGraw when he was but 15. Because of his extreme youth, he was immediately nicknamed "The Schoolboy Wonder". After a brief stint with the Giants, McGraw sent Hoyt to the minors for refinement and experience. Hoyt soon returned to the majors, this time with the Boston Red Sox. His performance there attracted the attention of the Yankees, who acquired him in 1920. In his first season as a Yankee, he won 19 games and pitched three complete games in the World Series without allowing an earned run — over his career, he would win six American League pennants with the Yankees and one with the Philadelphia Athletics. In his finest years with the Yankees, 1927 and 1928, Hoyt would post records of 22 wins and 7 losses with a 2.64 ERA and 23 wins and 7 losses with a 3.36 ERA. During his 21-year career, he won 10 or more games 12 times, 11 of them consecutively. Hoyt pitched for eight years after leaving the Yankees in 1930, but did not consistently display similar levels of pitching dominance. Hoyt finished his career with a win-loss record of 237–182 and an ERA of 3.59. By the time he retired in 1938, he had pitched the most victories in World Series history (his World Series record with the Yankees and A's was 6–4). In addition to the "Schoolboy" moniker appearing on his Hall of Fame plaque, Hoyt was also known as "The Merry Mortician", for when he was not playing baseball, he spent days working as a funeral director and nights appearing in vaudeville. As a vaudevillian, he appeared with many of the most well-known performers of the day, including Jack Benny, Jimmy Durante, George Burns, and others. He kept in shape during the off-season by playing semi-professional basketball. He added to his repertoire by becoming an accomplished painter and writer. After retiring as a player, Hoyt went into broadcasting. He was heard on WMCA in New York City but left that station to begin "a nightly quarter-hour program" of sports news and commentary on WNEW in New York, beginning October 17, 1938. During a stint as the host of Grandstand and Bandstand on WMCA, he tried to audition for the Yankees, but sponsor Wheaties vetoed him out of hand. The common view at the time was that former players did not have enough of a vocabulary to be successful broadcasters. However, Hoyt was well known for dressing down umpire George Moriarty when he missed a call by saying, "You're out of your element. You should be a traffic cop so you could stand in the middle of the street with a badge on your chest and insult people with impunity!" Dodgers voice Red Barber, however, thought more of Hoyt's abilities and hired him as color commentator and host of the pre- and post-game shows in 1940. After two years, he became the play-by-play voice of the Cincinnati Reds, a post he held for 24 years. He became as much a celebrity with the Reds as he was while a player. He was well known for calling games exclusively in past tense, which was and still is unusual for sportscasting. Where most baseball announcers would say, "Here's the pitch!" Hoyt would say, "There was the pitch!" He told author Curt Smith that he felt using past tense was accurate because "as I speak to you, what happened a moment ago is gone." On August 16, 1948, Hoyt paid tribute to Babe Ruth, speaking on the air without notes for two hours upon learning of his death after a game. He was well known as the pre-eminent authority on Babe Ruth; Hoyt for nearly 10 years was Ruth's teammate and in his small inner circle of friends. Robert Creamer, author of the definitive Ruth biography Babe, indicated in that book's introduction that the novella-length memoir written by Hoyt shortly after Ruth's death was "by far the most revealing and rewarding work on Ruth." Hoyt shared radio play-by-play duties for the 1953 All-Star Game on the Mutual Network and the second 1960 All-Star Game on NBC. He called the 1961 World Series for NBC Radio, during a time when it was common for the primary broadcasters for participating teams to be used in network broadcasts of the Fall Classic. 1961 was the only World Series during his tenure, leading Hoyt to call himself "a bad news broadcaster." Hoyt became known for entertaining radio audiences during rain delays, sharing anecdotes and telling vivid stories from his days as a player; a selection of these stories is collected on two record albums: The Best of Waite Hoyt in the Rain, and Waite Hoyt Talks Babe Ruth. Hoyt was one of the first professional athletes to develop a successful career in broadcasting and his name frequently appears on "all-time best" broadcaster lists. He retired from full-time broadcasting work in 1965, though he later made appearances on both radio and television, including the color commentary for the Reds telecasts in 1972. On June 10, 2007, the Reds honored Hoyt, Marty Brennaman, and Joe Nuxhall with replica microphones that are hung below the radio broadcast booth at Great American Ball Park in Cincinnati. An eternal optimist, Hoyt married his third wife, Betty Derie on March 5, 1983. Derie, a longtime fan, was an associate of Warren Giles, first President of the Reds and subsequently of the National League. Betty lived in Cincinnati until her death on December 25, 2015, and was interviewed extensively in the video biography Waite's World. The bio was released on VHS in 1997 and includes interviews with his son Chris, the late Hall of Fame broadcaster Joe Nuxhall, reporter and television personality Nick Clooney, and retired Reds pitcher Jim O'Toole. A longtime member of Alcoholics Anonymous, during the 1978 Old-Timers' Day game, Hoyt said wistfully that he would have won 300 games if he had stopped drinking during his playing days. After joining AA, he remained sober for more than 40 years. The aging Hoyt died of heart failure while preparing for what he realized would be his final visit to the Hall of Fame in Cooperstown, New York. Hoyt is interred in Spring Grove Cemetery in Cincinnati. ^ "The Rumble: AN OFF-THE-BALL LOOK AT YOUR FAVORITE SPORTS CELEBRITIES", New York Post, December 31, 2006. Accessed December 13, 2007. "The five Erasmus Hall of Fame legends include Raiders owner Al Davis, Bears quarterback Sid Luckman, Yankee pitching great Waite Hoyt, Billy Cunningham and Knicks founder Ned Irish." ^ "Schoolboy Wonder To Rejoin Giants". Star-Gazette. Elmira, New York. December 16, 1916. p. 8 – via Newspapers.com. ^ "Late Personal Notes" (PDF). Broadcasting. October 15, 1938. p. 73. Retrieved 31 January 2016. ^ Smith, Curt (2005). Voices of Summer. New York City: Carroll & Graf. ISBN 0-7867-1446-8. ^ Cook, William A. (2004). Waite Hoyt: A Biography of the Yankees' Schoolboy Wonder. McFarland. p. 209. Retrieved 17 July 2014. Wikimedia Commons has media related to Waite Hoyt. This page was last edited on 25 December 2018, at 04:29 (UTC).